Château Coupe-Roses is situated in La Caunette, little and beautiful village in Minervois, just close to the Montagne Noire (Black Mountain litterally). Our vines thrive on wide limestone uplands. Between 250 and 400m, in a suitable climate for aromas and acidity preservation, we are working our vines in organic production. Wine quality start in vines. With this thought are following our cultural practices : soil work is primordial, it allows vines to durably settle in its environment. Organic treatments ensures the preservation of an ecosystem. All this elements are giving a very unique raw material, which will be transcend with our work in the cellar. We invite you to discover our sensorial poetry universe. It belongs to you to come and share this universe with us. Château Coupe-Roses is, first of all, a family story. 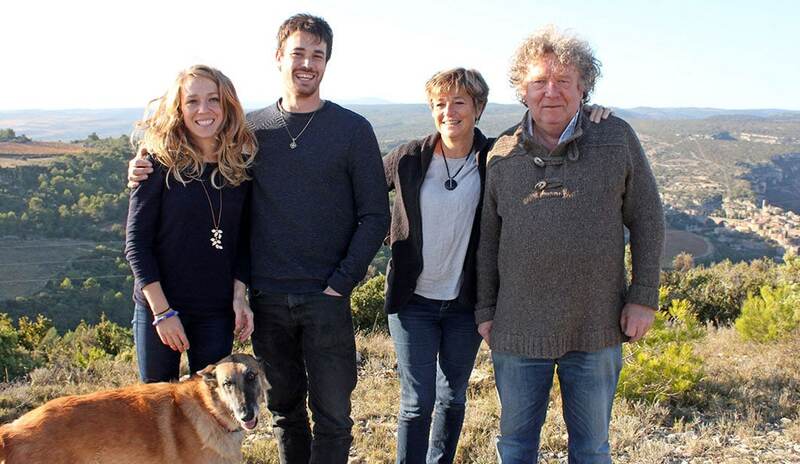 A family dedicated to wine and oenology. Françoise Frissant (agronomist), Mathias Paicheler, Sarah Frissant and Pascal Frissant (all Oenologists) are welcoming you at their estate Coupe-Roses, in La Caunette (near Minerve), to share with you wine passion and knowledge.